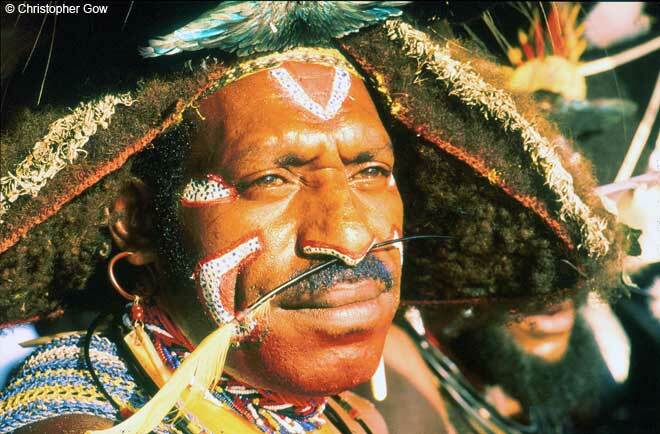 A Huli "Wigman" in the Southern Highlands of Papua New Guinea. As part of the coming of age ritual, young Huli men would retreat from society into an all male commune for several months while they grew their hair, carefully watering it every day to ensure it formed a perfect shape. It would then be carefully shaved off and adorned with decorative items including shells and dried flowers, and traditionally with the dried torso of a Bird of Paradise as the centrepiece. It could then be worn as a hat, with different versions for different occasions. After hunting birds of Paradise became illegal in the 80s (? ), the search was on for decorative alternatives such as the cartons or foil of Marlboro cigarette packets. As modern values seep into the ways of PNG’s highlands, few young men bother with the ritual hair growing nowadays. Instead a small handful of them make it a profession; growing several crops and selling the results to those who “can’t find the time”! The gent in this pic has the real McCoy on show – the tail spread of a Bird of Paradise… plus a feather in his nose for good measure. 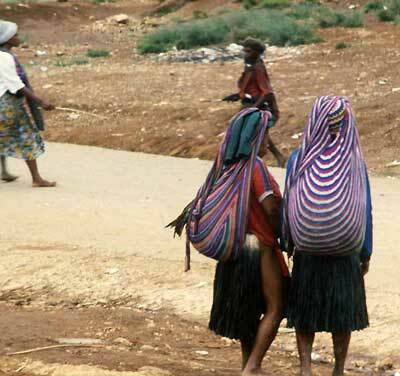 Over his shoulder is a Bilum, the traditional ubiquitous string bag used to carry everything from sweet potatoes from their gardens to infant children… in the case of women, who wear the bilum with the strap over their foreheads. Read more about Papua New Guinea and how you can visit this spectacular and most fascinating of countries.